The Raspberry Pi keyboard and hub includes three host ports for external devices. These can be used for connecting a USB mouse, USB drives or other USB controlled devices. The MicroUSB port in the centre is for connection to the Raspberry Pi. The Raspberry Pi provides control and power to the three USB Type A ports via the USB hub built into the keyboard. The official Raspberry Pi keyboard and hub provides three lock keys. These are Num Lock, Scroll Lock and Caps Lock. There are three LEDs in the top right corner to indicate which locks are enabled. Caps Lock – Enables capital letters to be typed. Use the Shift key to produce lower case letters in this mode. This mode is enabled and disabled by pressing the Caps Lock key. Num Lock – This enables the red number keys on the letter keys. This is useful for entering numbers like a calculator. This mode is enabled and disabled by pressing the Num Lock key. Scroll Lock – This enables the cursor keys for browsing. This is a way of browsing web pages and spreadsheets without the mouse. This mode is enabled and disabled by pressing the ScrLk key while holding the Fn key. 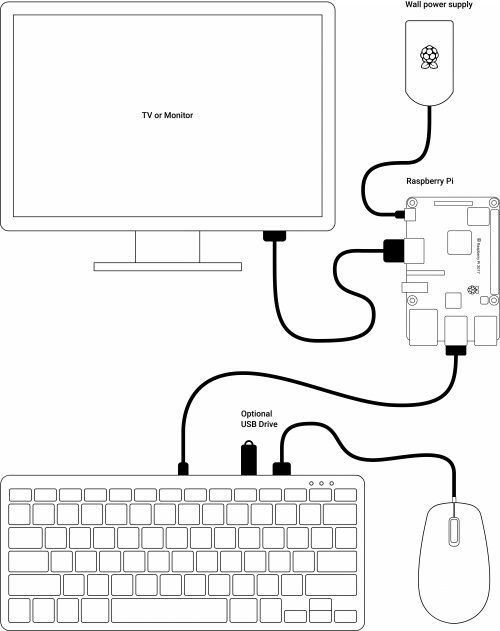 This is the recommended configuration of the Raspberry Pi and keyboard and mouse. The hub on the keyboard ensures easy access to USB drives, and the mouse cable can be short and tidy. The mouse cable is still long enough to use it in your left hand as well.